Benjamin Franklin played a pivotal role in the early days of our country. In addition to being the only Founding Father to sign the Declaration of Independence, the Treaty of Alliance with France, the Treaty of Paris establishing peace with Great Britain, and the U.S. Constitution, he was also a scientist, inventor, diplomat, and publisher. 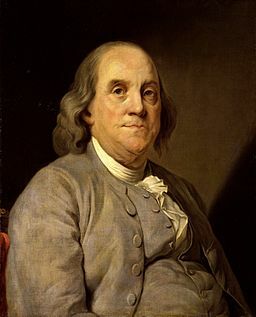 Benjamin Franklin was born on January 17, 1706, in Boston, Massachusetts. He was one of his parents’ eight children. Although his formal education ended when he was 10, Franklin was a skilled writer and avid reader. At age 12, he became a printer apprentice to his older brother James. He went on to work as a printer in London and Philadelphia. In 1728, Franklin opened his own printing shop in Philadelphia. One year later, he took over the Pennsylvania Gazette, publishing the newspaper and writing a great deal of the content under pseudonyms. Franklin also annually published the Poor Richard’s Almanack from 1733 to 1758. Many maxims, such as “Early to bed, early to rise, makes a man healthy, wealthy, and wise,” are still heard today. In 1730, Franklin took Deborah Read as his common-law wife. Because Read’s first husband had abandoned her, Franklin could not legally marry her. Franklin and Read had a son, Francis, who died of smallpox at age 4, as well as a daughter. Another son, William, was born out of wedlock. Franklin’s extremely successful printing business allowed him to retire in his 40s. Thereafter, he became increasingly involved in politics. After serving as the postmaster for Philadelphia, he was appointed the deputy postmaster-general for the British colonies in 1753. Franklin was also involved in civic projects and community affairs. He served as the first president of Academy and College of Philadelphia, which later became the University of Pennsylvania. In 1766, Franklin argued before the British Parliament against the Stamp Act of 1765, which required that all legal documents, newspapers, books, playing cards and other printed materials in the American colonies carry a tax stamp. In July 1775, the Continental Congress named Franklin the first postmaster general of the United States. In 1776, Franklin helped draft the Declaration of Independence. During the subsequent Revolutionary War, Congress sent Franklin to France, where he played in instrumental role in the country signing a Treaty of Alliance. In 1783, Franklin drafted and negotiated the Treaty of Paris that brought the Revolutionary War to an end. From 1785 to 1788, Franklin served as governor of Pennsylvania. Franklin also made many other scientific contributions. In 1752, he proved that lightning is electricity through his famous kite experiment. His studies and experiments also contributed to our early understanding of ocean currents, meteorology, and illnesses such as the common cold. In 1785, Franklin returned to Philadelphia from serving as Ambassador to France. Two years later, he served as one of Pennsylvania’s delegate to the Constitutional Convention. At age 81, he was the oldest delegate. He went on to argue in favor of ratification. Franklin on April 17, 1790, at the age of 84. He is honored for his many accomplishments with his image on the $100 bill.